The works in this eleventh volume present Byrd the recusant, covering the last year of his fashionable career in London and moving to a quieter life in the Essex countryside. The music is from two sources: the magnificent Cantiones Sacrae of 1591 and the Gradualia from 1607. 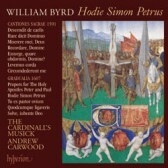 The seven motets from 1591 show Byrd to be pre-occupied with thoughts of desolation, loss, deprivation and separation – familiar ideas for the recusant Catholic community. A feeling of angst in the music is leavened by a sense of salvation and a glimmer of hope which is the composer’s constant refrain. The Gradualia are some of the most imaginative, modern-sounding and energetic music that the composer ever wrote.